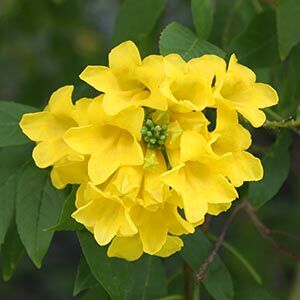 Magnificent yellow flowers on a small tree Tecoma stans is a long flowering plant that originally comes from tropical climates of Mexico, Southern USA and the Carribbean. With masses of great yellow flowers that will appear in summer in cooler climates, in warmer areas they will spot flower throughout the year. Foliage is a good mid green and acts as a great contrast to the flowers. The flowers appear in large clusters and will almost cover the tree in good conditions during peak flowering. Reaching around 6 – 10m in height over time the plant will form multiple trunks and can, if need be, be pruned to size. Although this is an evergreen tropical to sub tropical plant, Tecoma stans will grow well in cooler climates. In cooler climates it will drop some foliage over winter. In cooler climates, when in full flower this is a plant that adds a tropical look when planted in the right situation. However it is a plant that is is not as popular as it may seem – it has a few problems…. Humus rich well drained fertile soil. Sunny position to afternoon part shade. With such a beautiful tree you would think it might be more widely grown. It does however have a problem in that it self seeds very easily, especially in warmer climates. The seeds are dispersed by wind , and they will travel a long way, they also germinate fairly easily. In many areas of Queensland and New South Wales Tecoma stans is regarded as a weed.